On her Iowa City porch, Aviya Kushner sits down to read the King James Bible for the first time. Kushner, who spoke only Hebrew until she entered kindergarten, plunges herself into the English-language Bible for a class with Marilynne Robinson at the University of Iowa. I stop. There is a period at the end of the line. The offence Kushner takes at what appears to be simple punctuation launched her on a quest to write about the differences between reading the Bible in Hebrew and in English. She recounts this exploration in The Grammar of God: A Journey Into the Words and Worlds of the Bible. 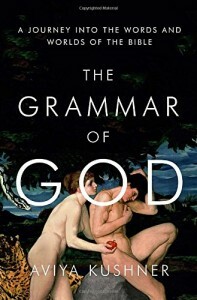 Kushner starts the book by describing the slight nuances in language and grammar that influence meaning. Take the first words: God ‘created the heavens and the earth.’ But the more accurate translation from Hebrew to English, Kushner says, is, ‘began to create.’ The words are small, but the difference in meaning is huge. In the chapters titled ‘Laughter’ and ‘Law’, Kushner explores the impact translation has had on issues such as women’s roles and slavery. In ‘Laughter’, Kushner writes about Sarah, the woman who laughed when she heard that she would finally bear a child in very old age. In English the laugh is quiet and simple; in the Torah her reaction is bolder and more unusual. Translation was one way to exert control over women. In English, Sarah provides a model for how women should behave when confronted with shocking news: quietly and demurely. In ‘Law’, we learn that language surrounding slavery in the English Bible is much more muted than in the Torah. The Torah uses words like ‘back-breaking labor’. Kushner points out, ‘In English, this is toned way down, made much less disturbing, less cruel and visceral.’ That tone helped Western culture justify slavery for centuries. Kushner expertly weaves together her Biblical exploration with memoir. About halfway through the book, she enters into an extended description of her father—their conversations, their long walks during Shabbat, his hard work that supported the family of seven. Her relationship with her father has shifted over time, just as a worshipper’s relationship with God changes over time. The last chapter, ‘Memory’, is the most poignant. Here, Kushner pays tribute to her grandfather, her mother’s father, the sole member of his family to get out of Germany before World War II and as such, the sole member to survive the Holocaust. This is a book not only for word nerds, but also for those interested in issues relating to politics and religion. Kushner shows us how words and translation form the foundation of the ideas and values we hold dear.